Disclaimer: This is a rather long post. But I have painstakingly provided all the details. 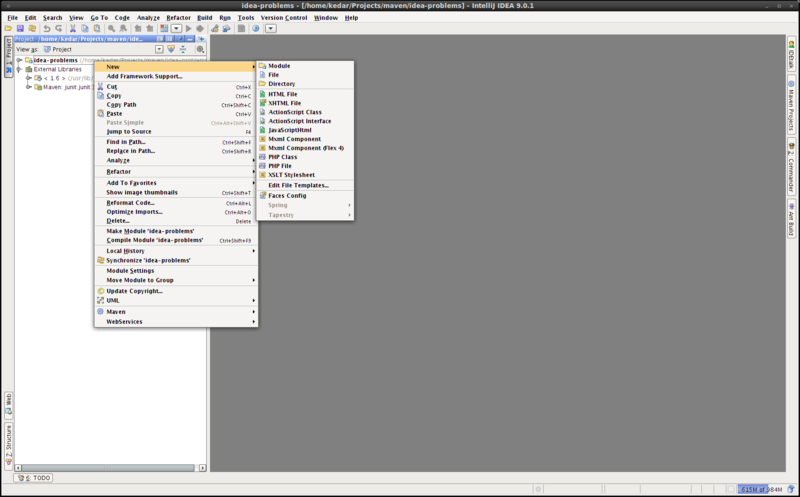 0- IDEA 9.0.1 (previous to latest) on Ubuntu 9.1.0. Java 1.6. Maven 2.2.1. 1- Since Maven is to be used, I created a simple archetype with the option 18 (mvn archetype:generate, choose 18). The pom.xml is created. I add the usual Java-1.5 cruft to build/compiler plugin. A simple POM gets generated. It builds the web-app war with mvn clean install. So far so good. See the pom.xml attached. 2- Open this pom.xml in IDEA. Opens well. 3- Now, I want to create a Servlet. The first problem I see here is that when the Project Window has the (default) View as:Project and then right-click for New ... and to my disbelief, there is no "Servlet" menu-item in it. What? I can't create a servlet for a Java web application? 4- I figuer out that I have to choose Packages in "View as:". Then, magically, "Servlet", "Filter", "Listener" start appearing! This is a bug (and a good one to fix), I suppose. 5- I choose New -> Servlet, provide the name etc. as TestServlet, provide some basic web.xml configuration for it and then it generates the boiler-plate servlet code. with all of javax.servlet classes/interfaces having the ugly red wavy underlines. Note that the scope is not "provided" which is probably more sensible default given that all standard servlet containers package the servlet-api classes/interfaces. This is a good RFE to fix, I suppose. 7- I do Maven->force reimport. The TestServlet that is created in src/main/resources still shows those ugly red underlines and my code completion goes for a toss. I can't do Ctrl+Space, Alt+Ctrl+Space on an instance of HttpServletRequest, HttpServletResponse in the boiler-plate servlet code that IDE generated. I can't use IDE is code completion does not work. Period. 8- This turns out to be finding out IDEA problems in Maven environment. The former was my choice (IDEA), the latter was enforced (Maven). I have to make this work in Maven environment, no choice. I give up. Please help reinstate my belief that it's me who is going wrong. Please suggest steps that I could alternatively take. Please make sure the servlet library is correctly resolved (check Maven Projects tool window). As for your suggestions, we'll try to do some improvements. I am still unsure why it does not work on my machine. On another machine a similar exercise works (no resolution problems). 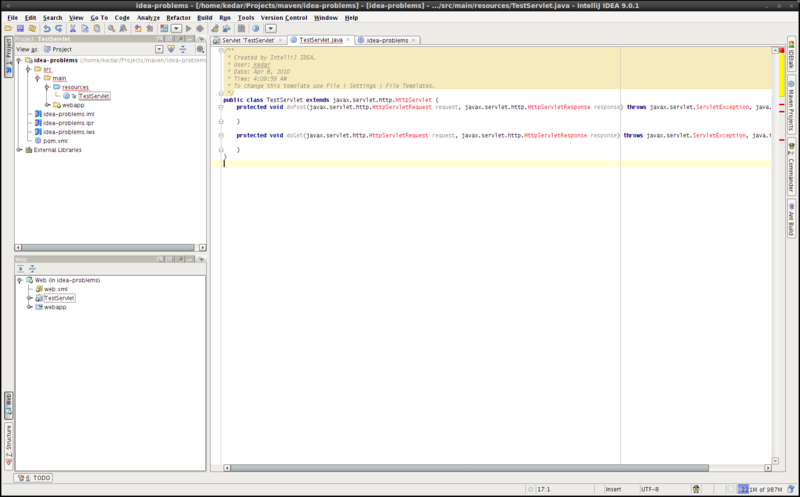 But in this machine, the IDE shows all libraries resolved in the Maven view.